For a brief moment in late October 2016, when Hillary Clinton was surfing on a six-point national lead over Donald Trump and James Comey had yet to dive-bomb the presidential race, the talk of the political class was a set of curious reports suggesting that after losing embarrassingly, Trump could soon pursue his own TV network. The chatter grew loud enough that, just two weeks before Election Day, the candidate had to start publicly fending off rumors about his aspirations of a media venture, for fear that his supporters would lose interest in him just as early voting was getting underway. Denials aside, it made some kind of sense. Here was a screw-the-system, longtime student and manipulator of the press who’d just upended one massive institution (a political party) turning his attention to another that he’d spent years rhetorically ripping to shreds (the mass media), just as everyone finally — after all these decades — knew, and would never forget, his name. The calculation still works. But Donald Trump isn’t the 2016 candidate who’s got a mini-media empire with a dedicated following all figured out. It’s Bernie Sanders. The Vermont senator, who’s been comparing corporate television programming to drugs and accusing it of creating a “nation of morons” since at least 1979 — and musing to friends about creating an alternative news outlet for at least as long — has spent the last year and a half building something close to a small network out of his office in the Dirksen Senate Office Building on Capitol Hill. He understands, but resents, the comparison to the man who’s described the news media as the “enemy of the people.” His take is different, and he has his own plans. “[Am I concerned] that people might see me and Trump saying the same thing? Yes, I am,” Sanders conceded, leaning back in a leather chair in a conference room in his office on a recent Tuesday, as footage of Mark Zuckerberg’s testimony one building over played on TVs throughout his office. Wearing his standard uniform — long tie, jacket in need of a few swipes with a lint roller — he launched into the critique now familiar to anyone who’s watched one of his rallies. “My point of view is a very, very different one. My point of view is the corporate media, by definition, is owned by large multinational corporations: their bottom line is to make as much money as they can. They are part of the Establishment. There are issues, there are conflicts of interest in terms of fossil fuel advertising — how they have been very, very weak, in terms of climate change.” Needless to say, the content he produces is not sponsored by advertisers. “The idea that we can do a town meeting which would get a significantly larger viewing audience than CNN at that time is something I would not have dreamed of in a million years, a few years ago,” Sanders says. The result is a growing venue for Sanders’s legions of backers, and other curious progressives, to take in tightly curated lefty takes on policy news — one that, increasingly, competes directly with more traditional news outlets for eyeballs. There’s little room for minute-by-minute analysis of White House drama or Robert Mueller’s probe — and no panels full of opining “strategists” — but also little room for dissent. The scale is unmatched by any other politician, inviting obvious questions about whether Sanders plans to pivot it into a massive primary campaign-mobilization machine come 2020. But the mainstream media criticism implicit in the venture also invites obvious comparisons — if equally stark contrasts — to the man crying “Fake news” at the other end of Pennsylvania Avenue. Bernie TV (that’s my shorthand: there’s no one name for the enterprise) is online only, and there are no plans to move it elsewhere, cable or otherwise. There’s no profit scheme — it’s produced using Senate resources — and there’s no plan to expand it beyond social media. But the programming represents by far the most advanced evolutionary stage of Sanders’s longtime goal of finding new ways to get around the traditional media and spread his “political revolution” directly. Sanders’s splashiest offerings are the spare 30-minute interviews with figures like Nye, Al Gore, and Bill de Blasio conducted in a small Senate studio. But the bulk of his programming are the short, tightly produced, and highly shareable videos that cover everything from Trump administration greed and lessons to learn from Canada’s health-care scheme to explainers from his staff (“John Bolton Should Scare Everyone,” says his foreign policy adviser in one recent offering) and real people’s straight-to-camera testimonials about their experiences with health care or tax systems. Only around one-quarter of the videos feature Sanders himself, though each is branded with his name. Sanders is after something bigger, and he’s getting there, in eye-popping fashion. In its first year, Bernie TV’s viewership soared: His office says his 2017 videos were viewed over 800 million times, led by a clip described as “Here’s what happened when a Republican senator challenged a Canadian doctor on their single-payer health care system,” which has been watched 32 million times. Two videos from Trump’s inauguration and the next day’s Women’s March each got around 15 million views. Then, when Sanders first televised a town hall on his Medicare for All proposal this January, 1.1 million saw it live, and another 1.6 million tuned in the next morning, a plurality of them men between the ages of 25 and 34, according to his staff. 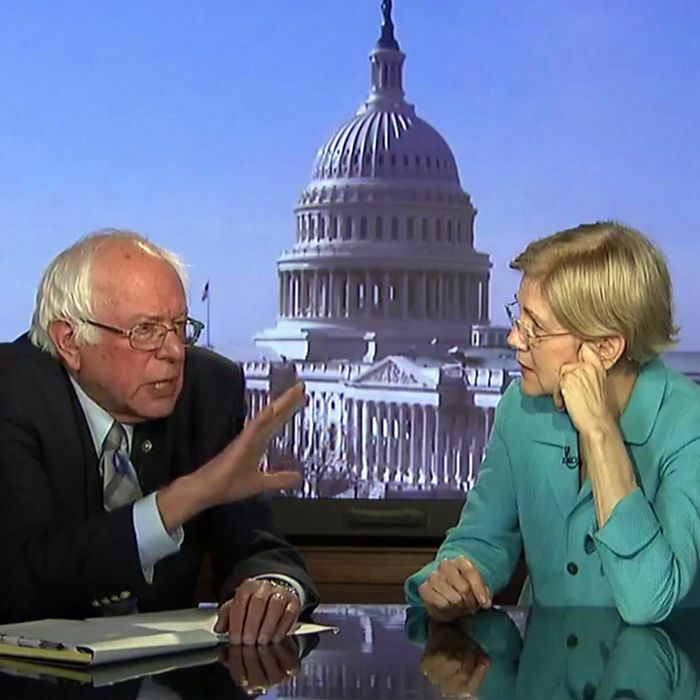 When he hosted a similar event about inequality with Massachusetts senator Elizabeth Warren and Michael Moore in March, 1.7 million watched live, and 2.5 million saw it the next day. This has never happened before. But most of it emerged without Sanders’s fellow senators paying attention; he rarely coordinates with his colleagues. That’s caused some grumbling among senior Senate staffers who would be happy to see their bosses join Sanders on air, and among others who are nervous that he’s stealthily building a huge operation ahead of a 2020 run. Sanders himself is open about the central role his media operation would play if he chose to run again (even his closest aides say he hasn’t yet decided). Already, potential opponents are closely studying his programming. If you buy Sanders’s formulation of What Went Wrong, those campaigns may not have much of a choice if they want to get their message out somehow. His theory of 2016 holds that the corporate media’s inability to focus on long-term issues is a big part of how Trump won in the first place. Those guys’ work amounts to what Sanders has been tilting at for decades, however improbable. The technology just finally made it a bit more possible. Even before he became a national figure, Sanders made his outsized aspirations explicit to his early Senate staff. Prior to running for president, he would regularly pull aside a small group of aides and muse aloud about creating a news agency that focused solely on policy — telling them that he considered his office to be a competitor to the New York Times. He considered his media operation so central to his broader mission of educating and galvanizing the public that during 2013’s government shutdown he changed Pennington’s official designation from “non-essential” so that Pennington could return from a mandatory furlough to the work of churning out independent content. By then, Sanders’s team was uploading everything he said in public to YouTube, often with little editing, and it tried circumventing traditional press by posting his materials to Reddit, too. Soon, Pennington was issuing regular formal reports to Sanders and other senior staffers that compared the engagement on Sanders’s Facebook page not only to other congressional offices, but to the Times, as well. Sanders had been building to that ambition since day one of his political career. When, in 1984, it came time for him to run for a second term, Burlington’s rookie mayor Sanders gathered his close aides and allies, and told them he’d announce his reelection campaign in a new way: with a small imitation newspaper he’d print himself. He’d made no secret of his disgust with the mainstream press (five years earlier, he’d referred to the advertising industry’s use of “Hitlerian principles” in conjunction with TV in a Vanguard Press column), and he was telling friends he was looking for ways to create his own alternative. He soon went multi-platform: He launched a Sunday radio show (“The Mayor Speaks”) and a cable access television show (Bernie Sanders Speaks With the Community), which he would use to interview locals or experts on a relevant topic, to recite poetry, or to rove around Burlington. The seeds of today’s production are visible: In October 1987 — almost exactly 30 years before his interview with Canadian doctor Danielle Martin racked up over 30 million Facebook views — Sanders conducted another long interview with a doctor about the Canadian health-care system. Then, when he got to Washington as a congressman, he regularly produced another program (Eye on Vermont) with his aide Jeff Weaver — 20 years later his presidential campaign manager — that he recorded and sent back to constituents. The presidential campaign poured gasoline on these long-flickering flames. Sanders’s behind-the-scenes frustration with the mainstream press and desire to create a parallel way to reach millions of people mounted as the race intensified, turning by 2016 into open anger about the “Bernie blackout” — a perceived lack of coverage of his campaign and its crowds in the national press, even if local reporters took notice when he touched down in their city. (To Clinton’s side, this claim was laughable: He may not have been getting much press, but little of the coverage he was getting at the time was negative.) His team started livestreaming rallies, which racked up more and more views as he challenged Clinton more directly. The race earned him prime media roles. He’s now a frequent participant in networks’ “town hall” style events and Senate Democrats’ most prominent face on Sunday news shows. But after the campaign, his dissatisfaction with his coverage boiled over: The final chapter of his post-2016 book is called “Corporate Media and the Threat to Our Democracy.” Since then, he’s sparred with reporters who cover political process, or issues including federal investigators’ scrutiny of his wife. He recently called a local reporter a “gossip columnist” for refusing to commit to not ask about it — a favored insult since the 1980s toward writers he doesn’t like. So within the friendly confines of his own office, Sanders constantly asks aides for updates on his video and tweet viewership numbers to make sure he’s playing a prominent enough role in the national conversation, say current and former staffers. Even while walking me the roughly ten feet across the producers’ workspace to get to his conference room, he stopped to ask a headphone-wearing Aviram for an update on his latest project. “Gene McCarthy walked away, he just went back to writing poetry. Howard Dean may have tried to do something, I dunno. But it was nothing like this,” marveled Bill Press, the liberal radio host who hosted the first planning sessions for Sanders’s 2016 campaign in his Washington townhouse in 2014. To Sanders and his closest allies, it’s obvious that his method of connecting directly with his supporters should soon become the national norm. That’s still not enough for the senator. He’s still acting incredulous that more people don’t see what’s happening before their eyes. Sanders stopped, and briefly smiled, evidently pleased to be tying a neat bow on the topic, complete with one last elbow. The very fact that his latest town hall had such a huge audience hadn’t gotten enough attention, he griped.